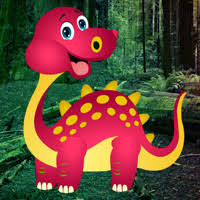 Games2Rule - G2R Little Dino Rescue Escape is another point and click escape game developed by Games 2 Rule. In this game, you came to see the beauty of a forest. But unfortunately, you noticed that someone trapped a little dino in a cage. You need to rescue the little dino from there by finding useful objects, hints and solving puzzles. Click on the objects to interact with and solve puzzles. Good luck and have fun! There's no real hotspot where to use the saw, but when you see a pile of logs, you know what to do. Really nice game. Thank you G2R! Long but fun. Not as hard as yesterday's WOW, but still challenging in spots. Very enjoyable game, thanks G2R.